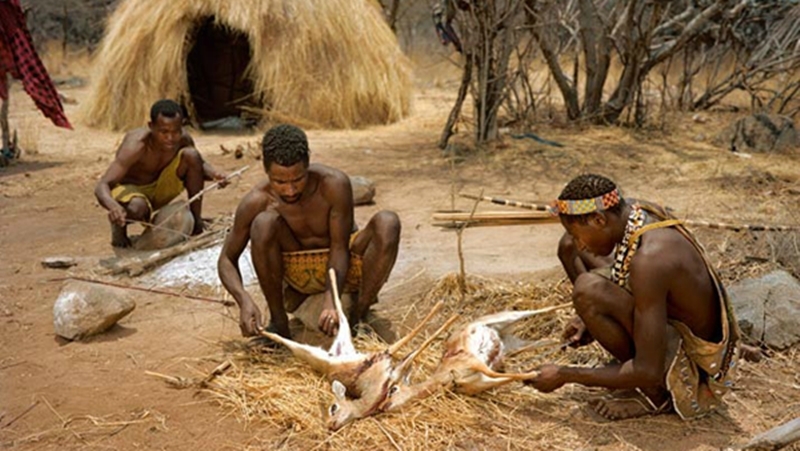 You want to go for a Hadzabe Bushmen tour in Africa?, look no further. Come join us on a bushman tour that will not only involve visiting and hunting with hadza tribe in Tanzania, but you will also get the chance to encounter the Datoga tribe all who live around Lake Eyasi area. About one hour’s drive south west of Karatu (on the Outskirts of the Ngorongoro Crater), lies Lake Eyasi one of the rift valley lakes that are situated in Tanzania. It is a shallow Seasonal lake that fills with water after rains and subsequently playing host to a myriad of birds species and providing water for the Hadzabe tribe of bushmen. Their language is similar to the Southern Africa’s Bushmen who speak the Click language and their language is believed to still have the clicks and pops like no other “ click language” up to the now. It is believed that about 10000 years ago the more hostile tribes of the Maasai and Iraqw (Mbulu), displaced this small African Bushman tribe from the Ngorongoro Crater and the Crater highland forests and they settled to their present day land around Lake Eyasi. The tribe is comprised of very few inhabitants of the Lake Eyasi area ; estimated at about just one thousand. These African Bushmen tribe do not rear cattle or produce farm produce at any time and rely fully on Hunting and gathering of fruits and berries for their up keep. With their strong Bows whose string is made out of Giraffe Tendons they are able to bring down small animals like dik diks, baboons, monkeys, large and small birds, to large game animals like zebras, giraffes, and buffaloes. The arrows are treated with a poison extracted from a tree well known to them. Hadzabe Bushmen tour of Tanzania. As the men go on the hunting sessions, women go for gathering of fruits and berries. They eat an amazing variety of wild fruits and berries like no other tribe in Tanzania. What has kept the Bushman People at the same place for so long is believed to be their habit of not using calendars and not counting time. The Hadzabe Bushmen are said to use only the Different stages of the moon to count time. They do not own belongings other than what they need for survival like the bows and arrows and some pots for cooking. These hospitable tribes men are equal and there is no one superior than the other in their society. In some of our Safari Packages in Tanzania we have included a visit of the Hadzabe Bushmen and also the Datoga Tribes men who have also kept their culture and traditions up to this time. Any time you want to do a Bushman safari in Africa , remember to visit the Hadzabe Bushmen of Tanzania and we will arrange the cultural tour for you. The Bushman tours to see the Hadzabe and Datoga tribes can be done independently from Arusha but that would require at least 2 to 3 nights and would require Mobile Camping arrangements. Otherwise the Visit to the bushmen can be included into a longer safari in Northern Tanzania and this will involve a camping safari or you may stay at the few accommodation options available; Tindiga Tented Camp or the luxury ; Kisima Ngeda Tented Camp. Recently a safari lodge has been set up called Lake Eyasi Lodge for those who would like to stay in a mid range concrete walled lodge.